The African Union, discussing the situation in Burundi, says Africa will "not allow another genocide to take place on its soil". The UN said it would send a fact-finding mission to Burundi amid fears that violence could spiral into civil war and possible ethnic conflict. Last Friday, 87 people were killed in clashes in the capital, Bujumbura. Unrest began in April when President Pierre Nkurunziza announced he would seek a third term in office. He survived a coup attempt in May, and secured a third term in disputed elections in July. 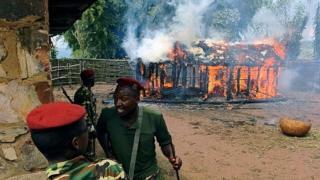 Is Burundi on the verge of ethnic conflict? AU Peace and Security Commissioner Smail Chergui has tweeted that the "clear" message coming from the AU is that the "killings in Burundi must stop immediately". The government has said there is no threat of genocide. The AU's peace and security council has been discussing sending an AU force to Burundi. Although international diplomats have warned about a possible return of genocide in Burundi, this dispute has not split the country along ethnic lines. Neither the government, nor the opposition have used ethnicity in their public statements, although each accuses the other of doing so. Under the 2005 peace deal which brought former Hutu rebel leader Pierre Nkurunziza to power, his fighters were integrated with the then Tutsi-dominated army and government. This remains the case today, with Tutsis occupying senior government and military positions and remaining loyal to their former enemy. Those opposed to Mr Nkurunziza are also ethnically mixed. For example, Gen Godfroid Niyombare, the leader of May's failed coup is a Hutu. UN High Commissioner for Human Rights Zeid Ra'ad al-Hussein said that "Burundi is at bursting point, on the very cusp of a civil war" which could have "ethnic overtones" similar to past conflicts in Burundi. At least 400 people have been killed, nearly 3,500 arrested and at least 220,000 people have fled the country since April, Mr al-Hussein said. At a special session convened at the US' request to discuss the conflict, the UN Human Rights Council resolved to despatch independent investigators to Burundi to probe abuses. An AU fact-finding mission returned from Burundi on Sunday and in its preliminary findings it said "members of the team heard reports of arbitrary killings, torture and the arbitrary... closure of some civil society organisations and the media". Ethnic conflict between Hutus and Tutsis in the 1990s claimed an estimated 300,000 lives. Mr Nkurunziza is the former leader of a Hutu rebel group, who has been in power since a 2005 peace deal. Both the government and the opposition are ethnically mixed. April 2015 - Protests erupt after President Pierre Nkurunziza announces he will seek a third term in office. May 2015 - Constitutional court rules in favour of Mr Nkurunziza, amid reports of judges being intimidated. Tens of thousands flee violence amid protests. May 2015 - Army officers launch a coup attempt, which fails. July 2015 - Elections are held, with Mr Nkurunziza re-elected. The polls are disputed, with opposition leader Agathon Rwasa describing them as "a joke". November 2015 - Burundi government gives those opposing President Nkurunziza's third term five days to surrender their weapons ahead of a promised crackdown. November 2015 - UN warns it is less equipped to deal with violence in Burundi than it was for the Rwandan genocide.